Instagram is one of the most popular social networking sites with more than 350 million daily active users posting pictures and videos on regular basis. It also rank 7th on the list of the top rated social networking sites with more than 150 million monthly consumers and become most profitable source of earning through social platform. 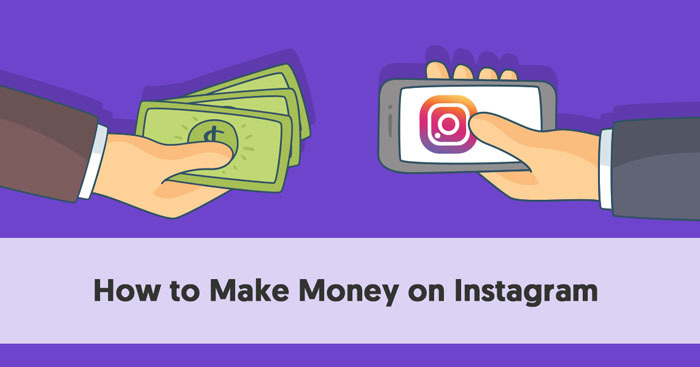 There might be number of questions arising in your mind that how one can earn money on instagrams through videos and pictures? Is it really possible or just a buzz rolling over the internet? Yes, Instagram is extremely profitable source of income if it is used appropriately and smartly. There are millions of consumers all over the world that shares pictures, videos, etc. just to enjoy the little moments of happiness with their close ones. But world-class photographers and creative people know how to make money out of these beautiful pictures and videos on instagram. Before thinking about profits do the lots of research work, put your efforts and time to build your audience through instagram activities. You might be a YouTuber, fashion designer, Influencer, model, blogger etc. but to be top-notch instagrammer, one must have the maximum audiences reach and influencer figured out. Both provides the prospects for instagram creators to discover diverse creeks of potential income to create an iconic brand or just earn some extras profits or free offers. Make your instagram content influential so that people should rely on exclusive brand. Instagram is undoubtedly one of the best places where your videos win the heart. Videos not only served as a visual communication but also act as delightful mode that add punches to the storyline. Viewers have an opportunity to post up to 60-second videos. And most of the top rated media firm keep sharing and posting video content on their instagram accounts to drive audience attention through videos because it captures more attentions than pictures. There are certain features than can help you to edit or make changes in the videos that you are really want to. You can also edit formerly shot videos in other apps other than instagram and upload with sound effect or just add the way you want. Endorse Your Business on Instagram: People can use instagram to endorse personal brands or business products/services through pictures and videos. It is a perfect channel to endorse fashion, beauty, food products, handmade products, artwork, painting etc. on instagram. There are diverse ways to create post by offering special offers, discount, cashback etc. to tempt your customers. Sometimes you can also share informative post to stay in touch with viewers. Your highest paying ads will be on the top of search results because the viewers can view them without scrolling down. There are number of organizations who desire to advertise on blog and pay if your blog increases in domain authority and page authority. But before signing up to publish their articles on your own blog, check whether your readers are really looking out for this content? Are they going to get benefits from the post? Does the post added in the blog will add value to the website? If you find it appropriate then you can go ahead with this deal. Instagram is a prominent place to make money, especially for the models, actors, actresses, selfie queen and many more that can raise the temperature over the internet. With the help of beautiful photography these models can becomes and internet sensation through social media platforms. To be the instagram star, it requires wise business skills, excellent marketing sense and outstanding work that can fascinate millions of eyeballs through creative photography. One can endorse your own brand or other agency products and services. There are number of organization and big brands who sign up models, actors, actresses to endorse their product or brands and they are been paid for that. Their pictures and videos are been published on instagram account and other social platform to promote their product and services. They sponsor these models, sign-up agreement with them and with their own mutual agreement they start using their name and pictures. Facebook has acquired mobile photo sharing app Instagram which slowly and gradually evolved over time and value to its business. It’s a free sharing mobile application, but the way it uses its algorithm to monetize consumers attentions has nurture over a period of time and also added up to is business value. Just like Facebook, Instagram earns most of its revenue through sponsored posts. These post have tag, call to action button. Due to its strong connectivity with the larger audiences, it has becomes a core element of Facebook’s revenue model. So just understand the basic criteria of Instagram and with the help of technical skills, creative pictures, mesmerizing videos one can build its own brand on Instagram or can promote company product through this platform. So make it more interesting by adding a flavor of quality rich content to the post and to your story line that create a buzz over the Instagram.